Allyson Jane: Welcome to Allyson Jane! I am so very excited to introduce you all to my little bakery called Allyson Jane! After tossing around several names for the store, I finally decided to go with my own name. The smile on my Mom's face was priceless when I told her! Some of you will recognize me as Ally from Girly Gatherings. My wonderful friends and business partners had taken a back seat with Girly Gatherings, so I decided to venture out on my own! Maureen and Adria over at Anders Ruff Custom Designs designed my logo and artwork! What do you think? I LOVE IT! Since they only take logo design on a select basis, I was obviously thrilled when they agreed to work with me! Celeste over at Lolatini Design Studio was so gracious to me when I asked her if she could squeeze me in with an emergency. She designed buttons just below the banner! To celebrate my new adventure, we are giving away 2 dozen cookies + free shipping from the Halloween Collection! For an additional entry, follow our blog and leave another comment with your favorite item on our site. The contest will close on Thursday October 7th, the winner will be announced on October 8th! I am delighted, beyond ecstatic and looking forward to my new adventures! Will you please help me spread the word? Hi Allyson - CONGRATS!!! on opening your own little bakery. I have always wanted to do that as well, only have a full blown catering business. I come from a family of caterer's and have been baking since I was old enough to reach the stove. I joined your FB page and am looking forward to seeing more of your beautiful work. You do a spectacular job!!! Have FUN and GOOD LUCK!!! BTW - my daughter's middle name is Allyson - love it!!! that is beyond exciting! just became a follower, congrats! i am now a follower and I LOVE that deck of cards cake! WOW! Your ART is fantastic - bonus you get to eat it!!! I 'liked' you on FB because I can't wait to see what you come up with next. Wow, so happy for you! I am a FB fan! 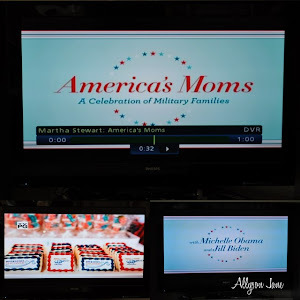 I absolutely love those Mom cookies with the turquoise trim on your sidebar. Every mom needs her own cookie!! So excited for you and now I'm a fan of Allyson Jane! Congrats!! Your work is beautiful and I love the logo!! It may be because I'm in the Autumn/Halloween decorating spirit, but I adore the Halloween collection...they're spooktacular!! P.S. I "like" you on FB!! Of course I'm a fan! You're amazing. And I love the work Maureen & Adria did on your logo. They rock. 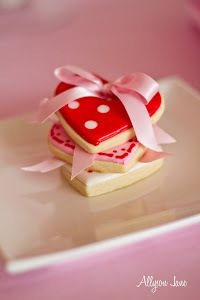 I follow your blog and love the Conversation Heart cookies! Congrats!! That is absolutely awesome!! I liked you on FB! Congrats! Best wishes with you new venture! Definitely a Facebook Fan! Congratulations, I'm so excited for you. I love the that you used your own name, it's perfect. Can't wait for all of the amazing things you'll bring to your blog. I'm a blog follower. I "liked" you on facebook!! Super excited for you! I became a follower of your blog! Love it! We are THRILLED for you! Had a blast designing your logo/banner. Keep up the awesome work. You are all the rage!! Congrats! That is awesome that you are venturing out on your own! Your website is pretty awesome! Can't wait to start referring my brides and clients to you! Became a fan! You are extremely talented. I'm a FB fan! I love, love, love cookies!!! I am so excited for you! Have been a fan on Facebook and also a "gawker" on your High Heels and Apron blog. Love them!! Cannot wait to see all that you come up with. I will be sharing with all my friends! I am a Facebook Fan!! Love your cookies!! I am so excited to see that you have started your business. I have made a few purchases from Posh Pixels and came across your Zebra Cookies and fell in LOVE! Blessings & Best Wishes with your new Business Venture! Love the cookie collections! Especially the Halloween cauldron! Such detail! I too became a fan! Following your blog. I think my fave so far is the Halloween cauldron, the sparkley purple brew is too cool. FB fan - looking forward to seeing more fabulous designs! Just became a facebook fan! Congratulations on your venture!! I am going to spread the word to my customers, I know they will love your work! 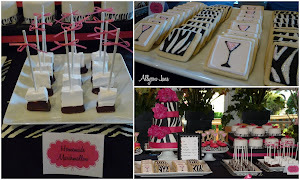 Following your blog also : ) The pink monogram and zebra cookies are fabulous!! Oh where were you 3 weeks ago when I was trying to find exactly that for our party on saturday... kicking myself!! Congrats! I've become a fan on FB.. and I'll be following your blog! I wish you much success! Just became a facebook fan! Your work is fantastic. Good Luck on your new business. Liked you on facebook . . . . beautiful work! Fabulous, Great Job!!!!!! Should I/Would I expect anything else, though!!?!! Thanks for covering for me with Lindsey's party with her amazing handpicked by Linz custom cake. Cookies, cupcakes and other treats for the goody bags when Nick was 1st diagnosed right before her 8th birtday. It meant so much to Linz but mostly to me. Thank you!!!!! liked you on facebook! Such cute stuff! I "like" your FaceBook page! :) You're stuff is so amazing! Going to suggest you to everyone! I'm a new follower! I love those new monster cookies you did! I follow your blog on my RSS feed on my phone! New Fan on facebook and think your work is incredible. I'm a bit jealous I can't create that well. ;) So I enjoy your artistic abilites instead. I'm a FB Fan! Would love to win your giveaway! I am also following your blog! My favorite item are those cute, cute monster cookies! I'm just liked you on FB and would love to win those fabulous cookies. My birthday is in Oct and what a fabulous present!! I am now following your blog. Love the Halloween cookies!! YUM!! OMG, your work is amazing...I am now a fan on FB, so excited to see what else you come up with in the future...stunning! Congratulations. I know you'll be a huge success. I love the girly cake with the E on top. So cute! I'm a follower! I love EVERYTHING! Just became a fan! Love the Halloween cookies! Congrats and good luck! This is so exciting for you! Congrats!!! The cupcakes you made for me were DELICIOUS!!! I've been wanting to order your famous zebra striped cookies too! :) Again, congrats to you and of course I'm a fan! Saw you on FB and became a FAN and a blog Follower. Wow, I sure could use you in the future -- developing an upscale children's birthday party business in Alabama. You are amazing - Congrats! I'm a follower! It's hard to choose one item! But I think the sandal cookies are adorable! WOW!! AMAZING work! I just wish you lived closer to northern Ca! I'm a fan! Congrats!!! We are so excited for you and we are really looking forward to having one of your amazing cakes at one of Kennedy's birthday parties soon!!! I also "liked" your facebook page! I'm now a fan on FB. I love your stuff, it's absolutely adorable!!! I now follow your blog :) My favorite is your birthday cake cookies with the little strand of icing pearls. I would love these for my daughter's 4th bday as a takeaway gift! I follow you on Facebook. Great masterpieces! I am now a huge fan on FB!!! Your cookies are simply gorgeous! I adore your Fleur De Lis and Eiffel Tower cookies...precious! 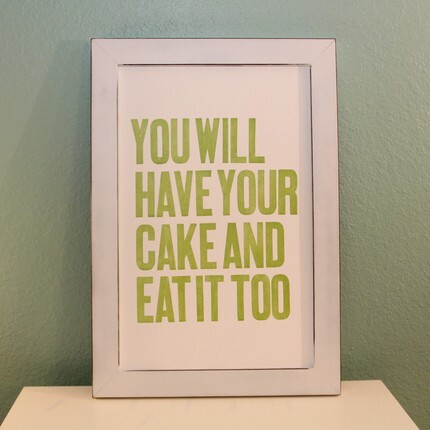 I also love your blog and though it's hard to choose from all the lovely treats... I think my favorite right now would be the French designs with the Fleur De Lis (because I'm from a French family) and Eiffel Tower, but the give away Halloween designs are a close second! Following your blog now. Congratulations opening your own bakery. So happy for you because that's my dream. I am a fan on facebook! 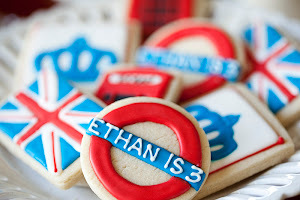 Amazing cookies! I am now following your blog too. The traditional Halloween cookies are my favorite - I am a sucker for glittery Halloween treats! I'm so excited for you! I've always admired your confections! I became a facebook follower too! I love all the cookies you make...they're gorgeous! I also love your poison apple recipe! Your monster cookies are the BEST!! Following your blog now...so fun! I am a Facebook Fan and adore your Halloween cookies! SO PRETTY! Best of luck with your new and exciting adventure! Darling things, very creative and professionally done. I'm you're latest blog follower and facebook fan. I'd LOVE to win those beautiful confections! I just became a follower of your blog, and have "liked" you on FaceBook. You have an amazing talent, and I wish you all the best in your new venture. Thank you so much for the opportunity to win some of your darling Halloween cookies!!! I am a FB fan. Your site is great. I am now following your blog and I absolutely love your Halloween Monster line. 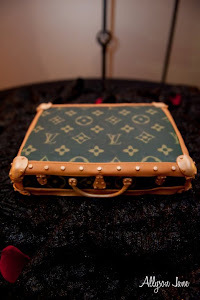 I love you couture cakes especially the corset and louis vuitton. Congratulations on the bakery! What fun! You do beautiful work. I 'liked' you on FB. I am also, now a follower of your blog! I'm a fan On your face book! I am also following your blog. LOVE the movie night 8th birthday party you did! AMAZING!! I became a fan of Allyson Jane and LOVE the new design and wish you the BEST luck and prosperity for the upcoming year on your own! Congrats! Hi Ally, I am a fan on FB and woudl love to enter your contest. Love all the cookies you do! Of course I became a new fan of Allyson Jane on Facebook. Wouldn't miss out on your new adventure. My favorite cookies are of course the ones that you have done for our parties. I still get comments everyday about them....You are amazing and I am so lucky to have found you when I did. I am also totally in love with your Halloween collection. I'm especially digging those colorful monsters! I am totally in love with the zebra cookies with the sparkles. So fun!! I also just became a follower of your blog. How blessed you are to have this amazing talent. All of your work is fabulous! I became a fan on FB! Congratulations! Love your designs, they are great! Now that I am a fan, and can follow what you create! Love love love!! Can't wait to see all of the exciting things that you come up with!!! Lovely! Those cookies are soooo pretty! Congrats on your new venture! My favorite items are the cookies in your Halloween monsters line. I love the little witch who only has eyelashes on one eye. So cute! Congrats on your new business venture! You are so incredibly talented! I'm looking forward to watching your business blossom into an amazing success! Love you! Congrats... I'm so happy for you...You are so talented....I wish you tons of success. I'm so impressed with your work! You are awesome! I also now follow your blog, and my favorite item was the movie reel and popcorn cake! That is so creative! Congratulations on your new venture! I just became a "fan" of yours and started following your blog. Your carrot cake bites look delicious! I am absolutely a fan!! I adore your work, and your blogs. Your recipes are amazing. I am going to make some of your marshmallows for my son's halloween party. Wish me luck! Your new logo is beautiful! Can't wait to see more. Ally, I have never had a chance to eat any of your cookies, but if they are as good as they look, I can't wait to try them. I know I get the chance on November 13th. Looking forward to it. Perhaps, I will win your Halloween cookies and try them sooner. I am a fan as well as added you to my facebook business pages. Best wishes for a successful year! I'm a fan!! Love your work!!! I am now following this blog (I didn't click the submit button, or whatever I needed to do for my google follow to go through the other day) ... anyway, since it is mentioned that one can post once for the FaceBook "like" and once for the blog "follow", I shall mention that I think your decorated Halloween cookies are just wonderful, and I can hardly wait to see what your Thanksgiving and Christmas line will look like. Thanks again for the opportunity to win 2 dozen of your darling Halloween cookies ... I hope the winner is me ... YUM!!! LOL! Jadore your cookies!! Je suis fan on fb!! Yeah! I am your fan on facebook.